After a great evening with a friends over last night celebrating Oktoberfest, I was surprised to wake up as spry as I was. This lead to lots of house cleaning, yard work, and of course heading out back with a Tatuaje 15th Anniversary and a Firestone walker 14th Anniversary Ale. 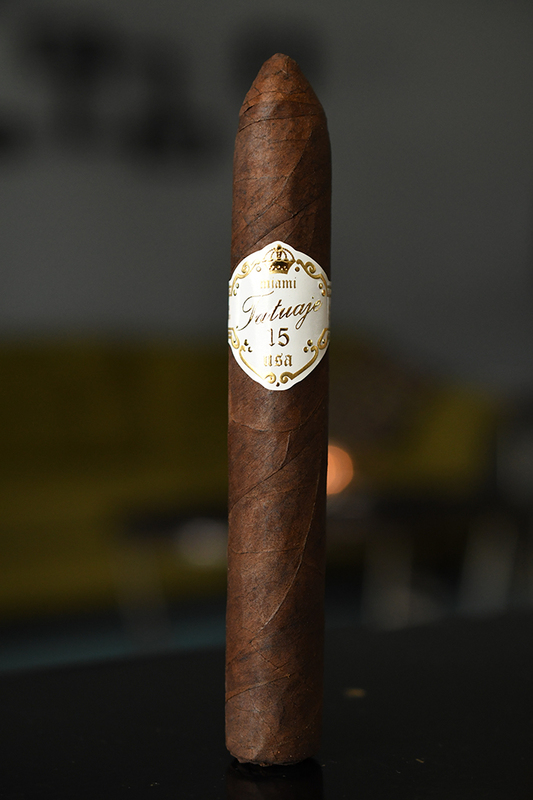 One of the most highly talked about releases at this year’s IPCPR show in Vegas was Pete Johnson’s Tatuaje 15th Anniversary. 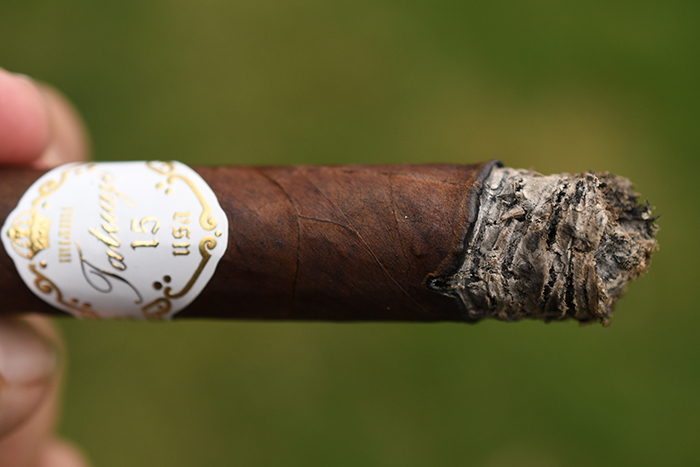 The 15th Anniversary comes in 2 blends, both with Nicaraguan binder and fillers. The difference comes in the form of the wrappers. One sports an Ecuadorian Rosado Claro wrapper, and the one we are looking at today is wrapped in an Ecuadorian Habano Oscar leaf. While this may be the first time the public has really gotten chance to try this cigar, halfwheel.com reported that both blends were originally released in 2004 and sold exclusively at Grand Havana Room until 2006. Both 15th Anniversary blends are released in two different sizes, Blicoso Fino (5 1/2 x 52) and Torpedo Grande (6 1/2 x 52). Each come packaged in boxes of 10 running $19 and $21 a stick respectively. I got mine over from our good friends at Cuenca Cigars who still have plenty in stock and ship directly to your door. 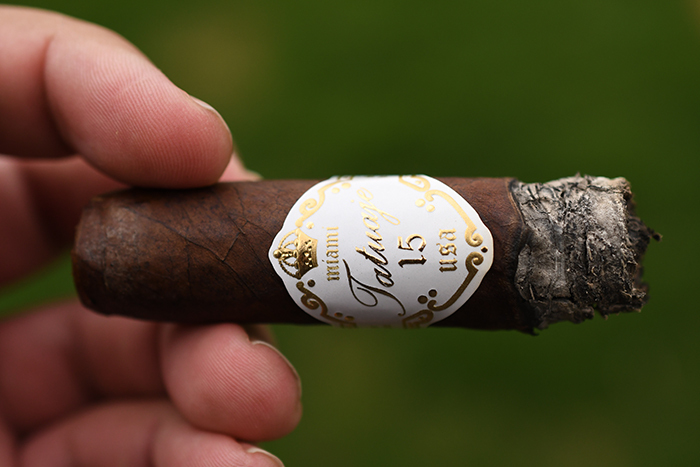 The Tatuaje 15th Anniversary Oscuro starts out with a very deep, dark brown wrapper. The color is consistently dark brown with only a few areas of darker webbing running through the wrapper’s leaf. The texture on the wrapper is very, very toothy and gritty. 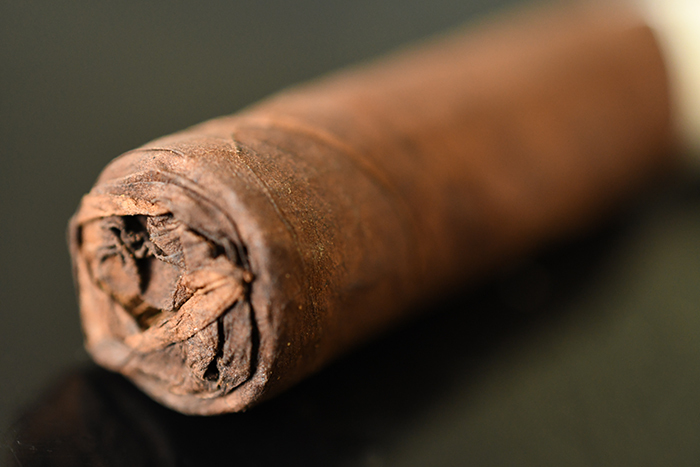 The wrapper feels very hard and dense while the cigar as a whole feels nicely packed, and pretty heavy. 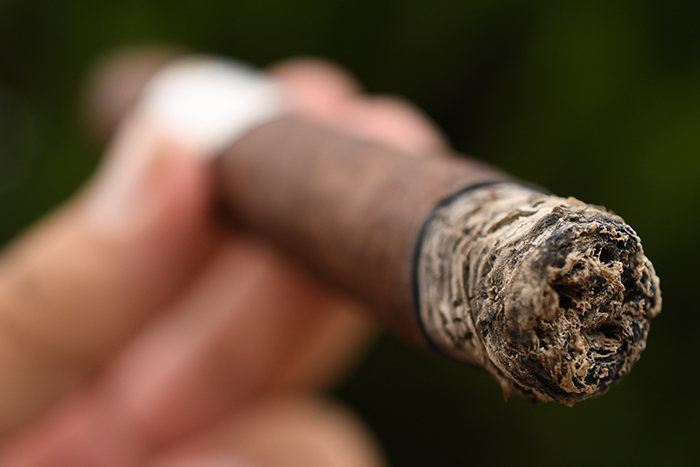 The wrapper on the foot of the cigar is carefully folded over itself covering the foot, as the cigar leads through it’s beefy body up to a tapered, round, torpedo style cap. 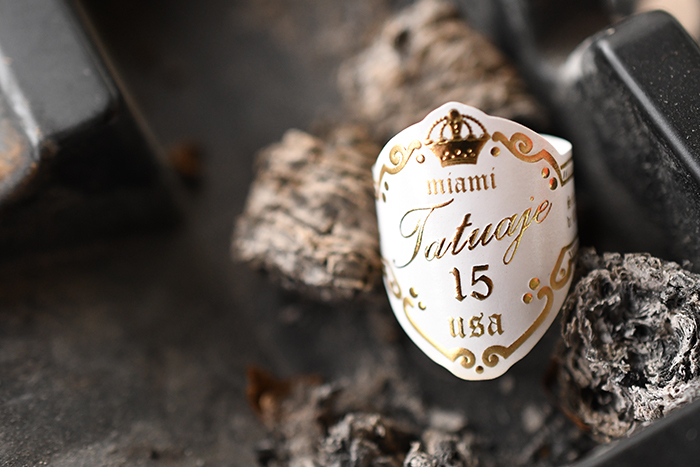 The cigar is then polished off with an extremely beautiful, and elegant white and gold band with the Tatuaje logo and 15th anniversary crest. 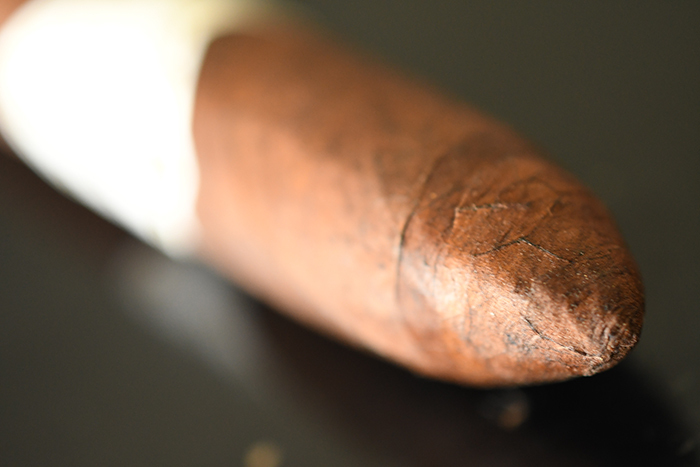 The foot of the cigar gives off lots of spice, sweetness, natural tobacco and a bit of tart. The wrapper on the cigar, well, its pretty much the same considering the cigar’s wrapper covers the foot. The Tatutaje 15th Anniversary starts out with a massive blast of cayenne pepper that left both my lips and tongue tingling. After a few puffs the pepper began to take a step back as the cigar released some great sweetness, brown sugar, cocoa, coffee, spice, and a whole lot of tartness. The draw is a bit tight on each of these that I smoked, but manageable. The burn line is slightly wavy leaving behind a trail of tightly compacted medium gray ash which held on for about an inch before falling into my ashtray. 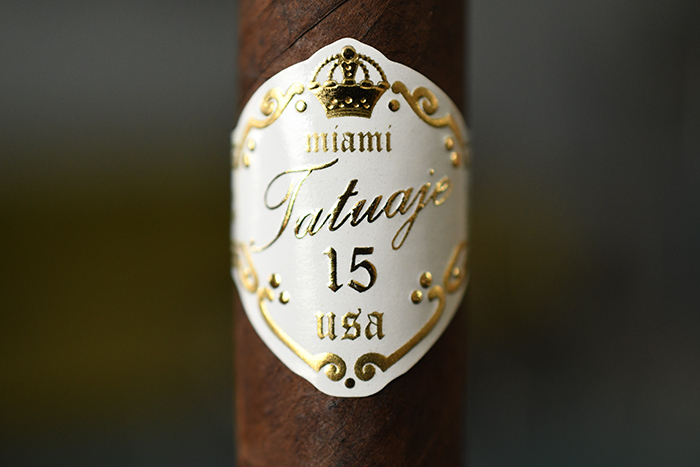 Into the second third of the Tatuaje 15th and the cigars is still pounding away on the flavors reaching into the full-bodied arena. Lots of tartness, currant, dark chocolate, spice, and some subtle brown sugar sweetness. The retrohale really brings out the pepper and some great oak that isn’t found in the traditional experience. The burn line is starting to correct itself with only some minor waves now as the draw is beginning to open up as well. I close out the second third with a very minor nicotine click. Into the final third of the Tatuaje 15th Anniversary Oscuro the and dark chocolate has really taken over the flavor profile. Backed by oat, tart cherry/currant, soft oak, and just a tad of sweetness. As I got down to the final inch and a half the pepper made a reappearance, but it was much more subtle. I close out the cigar with no extra harshness nor extended heat. While the cigar burned a bit wavy at times I never once had to reach for my torch to touch-up or relight the cigar so no marks taken there. The Tatuaje 15th Anniversary left me with a nice little nicotine kick. 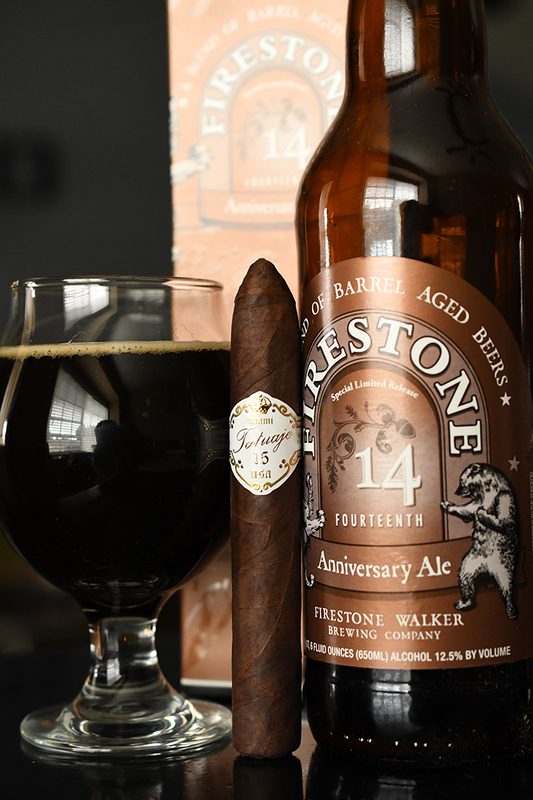 By now you should all be familiar with the Firestone Walker Anniversary series. Each year to celebrate Firestone Walker releases a blend of their Barrel Aged series beer. This particular blend was released about seven years ago. This particular blend consists of 31% Double Double Barrel Ale, 29% Stickee Monkey, 27% Parabola, 7% Velvet Merkin, 3% Good Foot, and 3% Black Xantus. Coming in at 12.5% this heavy beer leads with tart, dark chocolate, espresso, fig, caramel, and roasted malt with a very heavy mouthfeel before finishing with a whole mess of sweetness, decent boozy barrel, more tart dark chocolate, and caramel. The tartness, Dark Chocolate, caramel and malt paired wonderfully with the flavors in the Tatuaje 15th Anniversary while the cigar helped add a nice layer of spice to the beer. I would also pair this cigar with a nice tawny port, Belgian quad, or heavy barrel aged stout. This is a fantastic beer and I have to apologize to my buddy Jason who brought this over for a share some time ago. I just needed to take it down sooner or later and sorry we didn’t get to it last night!